Meningitis is a serious inflammation of the meninges, the thin, membranous covering of the brain and the spinal cord. Meningitis is most commonly caused by infection (by bacteria, viruses, or fungi), although it can also be caused by bleeding into the meninges, cancer, diseases of the immune system, and an inflammatory response to certain types of chemotherapy or other chemical agents. The most serious and difficult-to-treat types of meningitis tend to be those caused by bacteria. In some cases, meningitis can be a potentially fatal condition. Meningitis is a particularly dangerous infection because of the very delicate nature of the brain. Brain cells are some of the only cells in the body that, once killed, will not regenerate themselves. Therefore, if enough brain tissue is damaged by an infection, serious, life-long handicaps will remain. The space between the arachnoid and the pia contains CSF, which helps insulate the brain from trauma. Many blood vessels course through this space. CSF, produced within specialized chambers deep inside the brain, flows over the surface of the brain and spinal cord. This fluid serves to cushion these relatively delicate structures, as well as supplying important nutrients for brain cells. CSF is reabsorbed by blood vessels located within the meninges. A careful balance between CSF production and reabsorption is important to avoid the accumulation of too much CSF. Because the brain is enclosed in the hard, bony case of the skull, any disease that produces swelling will be damaging to the brain. The skull cannot expand at all, so when the swollen brain tissue pushes up against the skull's hard bone, the brain tissue becomes damaged and may ultimately die. Furthermore, swelling on the right side of the brain will not only cause pressure and damage to that side of the brain, but by taking up precious space within the tight confines of the skull, the left side of the brain will also be pushed up against the hard surface of the skull, causing damage to the left side of the brain as well. Another way that infections injure the brain involves the way in which the chemical environment of the brain changes in response to the presence of an infection. The cells of the brain require a very well-regulated environment. Careful balance of oxygen, carbon dioxide, sugar (glucose), sodium, calcium, potassium, and other substances must be maintained in order to avoid damage to brain tissue. An infection upsets this balance, and brain damage can occur when the cells of the brain are either deprived of important nutrients or exposed to toxic levels of particular substances. 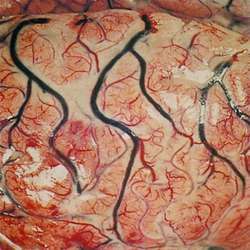 The cells lining the brain's tiny blood vessels (capillaries) are specifically designed to prevent many substances from passing into brain tissue. This is commonly referred to as the blood-brain barrier. The blood-brain barrier prevents various substances that could be poisonous to brain tissue (toxins), as well as many agents of infection, from crossing from the blood stream into the brain tissue. While this barrier is obviously an important protective feature for the brain, it also serves to complicate treatment in the case of an infection by making it difficult for medications to pass out of the blood and into the brain tissue where the infection is located. The most common infectious causes of meningitis vary according to an individual's age, habits, living environment, and health status. While nonbacterial types of meningitis are more common, bacterial meningitis is the more potentially life-threatening. Three bacterial agents are responsible for about 80% of all bacterial meningitis cases. These bacteria are Haemophilus influenzae type b, Neisseria meningitidis (causing meningococcal meningitis), and Streptococcus pneumoniae (causing pneumococcal meningitis). In newborns, the most common agents of meningitis are those that are contracted from the newborn's mother, including Group B streptococci (becoming an increasingly common infecting organism in the newborn period), Escherichia coli, and Listeria monocytogenes. The highest incidence of meningitis occurs in babies under a month old, with an increased risk of meningitis continuing through about two years of age. Older children are more frequently infected by the bacteria Haemophilus influenzae, Neisseria meningitidis, and Streptococci pneumoniae. N. meningitidis is the only organism that can cause epidemics of meningitis. In particular, these have occurred when a child in a crowded day-care situation or a military recruit in a crowded training camp has fallen ill with meningococcal meningitis. Viral causes of meningitis include the herpes simplex virus, the mumps and measles viruses (against which most children are protected due to mass immunization programs), the virus that causes chicken pox, the rabies virus, and a number of viruses that are acquired through the bites of infected mosquitoes. A number of medical conditions predispose individuals to meningitis caused by specific organisms. Patients with AIDS (acquired immune deficiency syndrome) are more prone to getting meningitis from fungi, as well as from the agent that causes tuberculosis. Patients who have had their spleens removed, or whose spleens are no longer functional (as in the case of patients with sickle cell disease) are more susceptible to other infections, including meningococcal and pneumococcal meningitis. The majority of meningitis infections are acquired by blood-borne spread. A person may have another type of infection (of the lungs, throat, or tissues of the heart) caused by an organism that can also cause meningitis. If this initial infection is not properly treated, the organism will continue to multiply, find its way into the blood stream, and be delivered in sufficient quantities to invade past the blood brain barrier. Direct spread occurs when an organism spreads to the meninges from infected tissue next to or very near the meninges. This can occur, for example, with a severe, poorly treated ear or sinus infection. Patients who suffer from skull fractures possess abnormal openings to the sinuses, nasal passages, and middle ears. Organisms that usually live in the human respiratory system without causing disease can pass through openings caused by such fractures, reach the meninges, and cause infection. Similarly, patients who undergo surgical procedures or who have had foreign bodies surgically placed within their skulls (such as tubes to drain abnormal amounts of accumulated CSF) have an increased risk of meningitis. Organisms can also reach the meninges via an uncommon but interesting method called intraneural spread. This involves an organism invading the body at a considerable distance away from the head, spreading along a nerve, and using that nerve as a kind of ladder into the skull, where the organism can multiply and cause meningitis. Herpes simplex virus is known to use this type of spread, as is the rabies virus. The most classic symptoms of meningitis (particularly of bacterial meningitis) include fever, headache, vomiting, sensitivity to light (photophobia), irritability, severe fatigue (lethargy), stiff neck, and a reddish purple rash on the skin. Untreated, the disease progresses with seizures, confusion, and eventually coma. A very young infant may not show the classic signs of meningitis. Early in infancy, a baby's immune system is not yet developed enough to mount a fever in response to infection, so fever may be absent. Some infants with meningitis have seizures as their only identifiable symptom. Similarly, debilitated elderly patients may not have fever or other identifiable symptoms of meningitis. Damage due to meningitis occurs from a variety of phenomena. The action of infectious agents on the brain tissue is one direct cause of damage. Other types of damage may be due to the mechanical effects of swelling and compression of brain tissue against the bony surface of the skull. Swelling of the meninges may interfere with the normal absorption of CSF by blood vessels, causing accumulation of CSF and damage from the resulting pressure on the brain. Interference with the brain's carefully regulated chemical environment may cause damaging amounts of normally present substances (carbon dioxide, potassium) to accumulate. Inflammation may cause the blood-brain barrier to become less effective at preventing the passage of toxic substances into brain tissue. The most important test used to diagnose meningitis is the lumbar puncture (commonly called a spinal tap). Lumbar puncture (LP) involves the insertion of a thin needle into a space between the vertebrae in the lower back and the withdrawal of a small amount of CSF. The CSF is then examined under a microscope to look for bacteria or fungi. Normal CSF contains set percentages of glucose and protein. These percentages will vary with bacterial, viral, or other causes of meningitis. For example, bacterial meningitis causes a greatly lower than normal percentage of glucose to be present in CSF, as the bacteria are essentially "eating" the host's glucose, and using it for their own nutrition and energy production. Normal CSF should contain no infection-fighting cells (white blood cells), so the presence of white blood cells in CSF is another indication of meningitis. Some of the withdrawn CSF is also put into special lab dishes to allow growth of the infecting organism, which can then be identified more easily. Special immunologic and serologic tests may also be used to help identify the infectious agent. In rare instances, CSF from a lumbar puncture cannot be examined because the amount of swelling within the skull is so great that the pressure within the skull (intracranial pressure) is extremely high. This pressure is always measured immediately upon insertion of the LP needle. If it is found to be very high, no fluid is withdrawn because doing so could cause herniation of the brain stem. Herniation of the brain stem occurs when the part of the brain connecting to the spinal cord is thrust through the opening at the base of the skull into the spinal canal. Such herniation will cause compression of those structures within the brain stem that control the most vital functions of the body (breathing, heart beat, consciousness). Death or permanent debilitation follows herniation of the brain stem. Antibiotic medications (forms of penicillin and cephalosporins, for example) are the most important element of treatment against bacterial agents of meningitis. Because of the effectiveness of the blood-brain barrier in preventing the passage of substances into the brain, medications must be delivered directly into the patient's veins (intravenously, or by IV), at very high doses. Antiviral drugs (acyclovir) may be helpful in shortening the course of viral meningitis, and antifungal medications are available as well. Other treatments for meningitis involve decreasing inflammation (with steroid preparations) and paying careful attention to the balance of fluids, glucose, sodium, potassium, oxygen, and carbon dioxide in the patient's system. Patients who develop seizures will require medications to halt the seizures and prevent their return. Viral meningitis is the least severe type of meningitis, and patients usually recover with no long-term effects from the infection. Bacterial infections, however, are much more severe, and progress rapidly. Without very rapid treatment with the appropriate antibiotic, the infection can swiftly lead to coma and death in less than a day's time. While death rates from meningitis vary depending on the specific infecting organism, the overall death rate is just under 20%. The most frequent long-term effects of meningitis include deafness and blindness, which may be caused by the compression of specific nerves and brain areas responsible for the senses of hearing and sight. Some patients develop permanent seizure disorders, requiring life-long treatment with anti-seizure medications. Scarring of the meninges may result in obstruction of the normal flow of CSF, causing abnormal accumulation of CSF. This may be a chronic problem for some patients, requiring the installation of shunt tubes to drain the accumulation regularly. Prevention of meningitis primarily involves the appropriate treatment of other infections an individual may acquire, particularly those that have a track record of seeding to the meninges (such as ear and sinus infections). Preventive treatment with antibiotics is sometimes recommended for the close contacts of an individual who is ill with meningococcal or H. influenzae type b meningitis. A meningococcal vaccine exists, and is sometimes recommended to individuals who are traveling to very high risk areas. A vaccine for H. influenzae type b is now given to babies as part of the standard array of childhood immunizations. Meningitis Foundation of America. 7155 Shadeland Station, Suite 190, Indianapolis, IN 46256-3922. (800) 668-1129. 〈http://www.musa.org/welcome.htm〉. 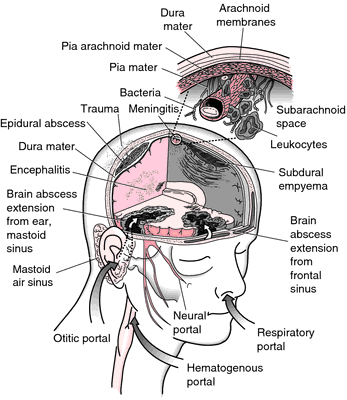 basilar meningitis that affecting the meninges at the base of the brain. cerebral meningitis inflammation of the membranes of the brain. cerebrospinal meningitis inflammation of the membranes of the brain and spinal cord. chronic meningitis a variable syndrome of prolonged fever, headache, lethargy, stiff neck, confusion, nausea, and vomiting, with pleocytosis; due to a variety of infectious and noninfectious causes. cryptococcal meningitis cryptococcosis in which the meninges are invaded by Cryptococcus . eosinophilic meningitis meningitis characterized by an increase in lymphocytes and a high percentage of eosinophils in the cerebrospinal fluid, usually due to Angiostrongylus cantonensis infection. epidemic cerebrospinal meningitis meningococcal m.
meningococcal meningitis an acute infectious, usually epidemic, disease attended by a seropurulent meningitis, due to Neisseria meningitidis, usually with an erythematous, herpetic, or hemorrhagic skin eruption. occlusive meningitis leptomeningitis of children, with closure of the lateral and median apertures of the fourth ventricle. meningitis ossi´ficans ossification of the cerebral meninges. otitic meningitis that secondary to otitis media. spinal meningitis inflammation of the membranes of the spinal cord. tubercular meningitis , tuberculous meningitis severe meningitis due to Mycobacterium tuberculosis. viral meningitis that due to a virus, e.g., coxsackieviruses, mumps virus, or the virus of lymphocytic choriomeningitis, marked by malaise, fever, headache and other aches, nausea, and cerebrospinal fluid pleocytosis (mainly lymphocytic); it usually runs a short uncomplicated course. Inflammation of the meninges of the brain and the spinal cord, most often caused by a bacterial or viral infection and characterized by fever, vomiting, intense headache, and stiff neck. any infection or inflammation of the membranes covering the brain and spinal cord. It is usually purulent and involves the fluid in the subarachnoid space. The most common causes in adults are bacterial infection with Streptococcus pneumoniae, Neisseria meningitidis, or Haemophilus influenzae. Aseptic meningitis may be caused by nonbacterial agents such as a high dose of intravenous immunoglobulin, chemicals, neoplasms, or viruses. Many of these diseases are benign and self-limited, such as meningitis caused by strains of coxsackievirus or echovirus. Others are more severe, such as those involving arboviruses, herpesviruses, or poliomyelitis viruses. Yeasts such as Candida and Cryptococcus may cause a severe, often fatal meningitis. A kind of meningitis is tuberculous meningitis. Compare encephalitis. Also called cerebromeningitis. observations The onset of meningitis is usually sudden and characterized by severe headache, stiffness of the neck, irritability, malaise, and restlessness. Nausea, vomiting, delirium, and complete disorientation may develop quickly. Temperature, pulse rate, and respirations are increased. Residual damage may include deafness, blindness, paralysis, and mental retardation. Hydrocephalus also may develop. interventions Bacterial meningitis is treated promptly with antibiotics specific for the causative organism. They are administered intravenously or intrathecally. Antifungal medications, such as amphotericin B, given intravenously or intrathecally for several weeks, may prevent death from fungal meningitis, but serious neurological sequelae may occur. nursing considerations Constant skilled nursing attention is necessary to ensure early recognition of rising intracranial pressure, to prevent aspiration in the event of convulsive seizures, and to prevent airway obstruction. Except for the first day or two of meningococcal disease, strict isolation procedures are unnecessary. IV fluids and nasogastric tube feeding may be necessary for a prolonged period. Sedatives and narcotic analgesics should not be used because they may obscure important neurological signs in addition to depressing vital functions. Inflammation of the meninges due to microorganisms (viral, bacterial, fungal, parasitic), less commonly due to drugs. Headache, neck stiffness, fever, confusion, vomiting, photophobia. CT, MRI, EEG (rarely performed), CBC (Lumbar puncture), CSF (increased neutrophils, increased protein). Irritation, respiratory distress, altered sleep patterns, vomiting, lethargy, labile temperature, shock, bulging fontanelles. Irritation, altered sleep patterns, vomiting, lethargy, fever, shock, nuchal rigidity, coma, shock. Headache, stiff neck, photophobia, myalgia, lethargy, fever, shock, nuchal rigidity, coma, shock. • Neonates—E coli, group B streptococcus. • Infants—Streptococcus agalactidae, E coli, Klebsiella, Enterobacter, Pseudomonas, Serratia, Listeria monocytogenes, Citrobacter diversus. • Children—H influenzae, S pneumoniae, Neisseria meningitidis. • Adolescents—Neisseria meningitidis, Haemophilus influenzae. • Elderly—Streptococcus pneumoniae, Listeria monocytogenes. • Others—TB (often with co-existent encephalitis). Neurology A condition characterized by potentially fatal meningeal inflammation Pathogenesi Infants, Streptococcus agalactiae, E coli, Klebsiella-Enterobacter, Pseudomonas, Serratia, Listeria monocytogenes, Citrobacter diversus; children, H influenzae, S pneumoniae, Neisseria meningitidis Workup CT, MRI, EEG–rarely performed, CBC & CSF–↑ WBCs/PMNs, ↑ CSF protein Management Neonates ampicillin ±ceftriaxone ±gentamicin; older children, ceftriaxone, cefotaxime. See Aseptic meningitis, Bacterial meningitis, Cryptococcal meningitis, Eosinophilic meningitis, Gram negative meningitis, H influenzae meningitis, Lymphocytic choriomeningitis, Meningococcal meningitis, Mollaret's meningitis, Neoplastic meningitis, Pneumococcal meningitis, Pseudomeningitis, Purulent meningitis, Staphylococcal meningitis, Tuberculous meningitis. Meningitis may result from infection with bacteria, viruses, mycobacteria, fungi, amebas, or noninfectious sources, such as chemical irritation. Occasionally, infectious meningitis follows head trauma or sinus or ear infection. It also may result from the spread of blood-borne infection. The symptoms of meningitis include fever, chills, headache, stiff neck, altered mental status, vomiting, and photophobia. Many patients with meningitis present with only two or three of these clinical indicators. Acute bacterial meningitis and meningitis caused by some fungi and amebas may also cause rapid deterioration in mental status, seizures, shock, and death. Cerebrospinal fluid (CSF) must be examined. A cell count to assess the level of inflammation, a Gram stain to look for infectious organisms, measurement of spinal fluid pressure, and levels of bacterial antigens, glucose, lactate, and protein are typically obtained. CSF may appear milky-white due to the large numbers of white blood cells present. All children in the U.S. are now vaccinated against H. influenzae type b (Hib) and pneumococcus (Prevnar) as primary prevention against the disease. Meningococcal polysaccharide vaccines are highly effective in preventing the disease during epidemic outbreaks with this organism. Close family contacts of patients with meningococcal meningitis, day care center contacts of infected children, or any persons (including health care workers) with direct contact with the saliva of infected patients are to be treated with antibiotics to prevent disease transmission. Definitive treatment depends on identification of the underlying causes, but empirical therapies for infectious meningitis must be given immediately, hours before the causative agent is identified. Dexamethasone is administered intravenously before starting antibiotic therapy for best response to reduce the incidence of deafness in children (a common complication) and to help prevent death in adults with pneumococcal meningitis. The evolution of penicillin-resistant strains of pneumococci has altered traditional empirical treatments. Third-generation cephalosporins, ampicillin and gentamicin, chloramphenicol, or vancomycin plus rifampin have been given, depending on the patient's age, level of immune function, or clinical presentation. Antibiotic therapy is usually administered intravenously for 2 weeks, then orally for a prescribed period for bacterial infections. Viral meningitis treatment is supportive; recovery usually is complete (within 7 to 10 days). Antipyretic analgesics relieve headache and fever. Specific measures for coexisting conditions and for shock and other complications (disseminated intravascular coagulation, metabolic acidosis, or seizures) should be initiated when indicated. Supportive therapies include bed rest, a dimly lit room, and reduced sensory stimulation. Standard precautions apply, and airborne/droplet precautions are initiated if nasal cultures are positive. Neurologic function is closely monitored for changes in level of consciousness, signs of increasing intracranial pressure (ICP), and indications of cranial nerve involvement. Fluid and electrolyte balance is monitored, and fluids are provided in quantities to prevent or treat dehydration while avoiding fluid overload and resultant cerebral edema. The patient is assessed for adverse effects of antibiotic therapy with peak and trough blood levels assessed to ensure therapeutic levels and avoid toxic overdose. The patient is repositioned carefully and assisted with range-of-motion exercises to prevent skin, muscle, and joint complications. Frequent mouth care is provided and adequate nutrition and elimination are maintained. Small frequent meals, nasogastric or parenteral feedings are provided as required. Constipation is prevented by stool softeners or mild laxatives to prevent straining, which could increase ICP. Basic explanations, realistic reassurance, and support are provided, with reorientation if delirium or confusion is present. Questions from the patient and family should be answered honestly, with reassurance that behavioral changes usually resolve. The patient with infectious meningitis may need monitoring in an ICU. Patients with neurologic deficits that appear to be continuing should be referred to a rehabilitation program once the acute phase of illness has ended. To help prevent meningitis, patients with chronic sinusitis or other chronic infectious or inflammatory illnesses should be taught the importance of proper hand hygiene and of following through with prescribed treatments. Sterile techniques should be strictly enforced when treating patients with head wounds, skull fractures, or lumbar puncture, ventricular shunting, or other invasive therapies. A nonpurulent form of meningitis often due to viral infection. It usually runs a short, benign course, marked by fever and headache and ending with recovery. Meningitis without obvious evidence of bacterial infection. It typically results from a viral infection (such as coxsackievirus or other enteroviruses) although frequently no causative organism is identified. Patients report fever, headache, stiff neck, malaise, and sometimes altered mental status or photophobia. Treatment is supportive, with antipyretics and pain-relieving medications administered as prescribed. The virus can be spread by direct contact with saliva, sputum, mucus, or stools of an infected person. Standard precautions apply, with droplet precautions if nasal cultures are positive; contaminated articles are disposed of by double bagging. Neurological status is monitored for changes in level of consciousness and for increases in intracranial pressure. Personal hygiene is provided, and measures to prevent complications due to immobility are implemented. Gentle position changes are performed to reduce excessive stimulation. Artificial airway, suction, and oxygen are readily available. A quiet, dark atmosphere is provided, and siderails are padded to reduce the risk of injury. Prescribed analgesics are administered, and cool compresses are applied to the forehead to relieve headache. Intravenous fluids or tube feedings are administered as ordered, and intake and output are monitored. Assessments are made for complications such as shock, respiratory distress, and disseminated intravascular coagulation. Since mosquitoes can spread some viruses that cause meningitis, avoiding mosquito bites during the warm months of the year by wearing insecticides (DEET) and barrier protection, and eliminating standing pools of water, where mosquitoes breed, may help prevent the disease. The public should be made aware of meningitis symptoms (fever, headache, stiff neck, altered levels of consciousness) and the importance of prompt attention for any patient suspected of meningitis. Meningitis caused by disease-causing and potentially life-threatening organisms, esp. 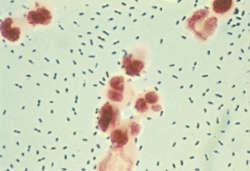 Streptococcus pneumoniae, Haemophilus influenzae, Neisseria meningitidis, and Listeria monocytogenes. Meningitis by metastatic tumor cells. It may produce symptoms such as headache, backache, confusion, nerve palsies, or seizures and should be suspected when these symptoms arise in patients with known cancers. The diagnosis is confirmed by lumbar puncture with analysis of the cerebrospinal fluid for tumor cells. Acute or chronic meningitis of the brain. Meningitis of the brain and spinal cord. Meningitis marked by persistent fever, headache, and stiff neck (associated, on lumbar puncture, with cerebrospinal fluid pleocytosis and elevated spinal fluid pressure). The underlying cause of this cluster of findings may be initially difficult to determine. Syphilis, cryptococcosis, HIV infection, or invasion of the meninges by cancer cells may be responsible. Occasionally, repeated lumbar punctures reveal a vasculitis of the central nervous system or a partially treated bacterial meningitis. Fungal meningitis due to Cryptococcus neoformans. A rare cause of disease in healthy hosts, cryptococcal meningitis is an opportunistic infection usually seen in patients with advanced AIDS or patients taking high-dose steroids. It usually presents with gradually progressive headache and fever. The serum cryptococcal antigen test is a useful screening test. The diagnosis is established by the results of analysis and culture of cerebral spinal fluid. Treatment options include amphotericin B, often with flucytosine. Fluconazole and/or related antifungals are sometimes used for maintenance therapy. Meningitis caused by various serogroups of Neisseria meningitidis. Meningitis due to Streptococcus pneumoniae, a disease predominantly found in adults. In the U.S., about 20% of affected patients die. Because of the worldwide emergence of streptococcal resistance to penicillins, chloramphenicol, and cephalosporins, vancomycin, rifampin, and other antibacterial agents are used to treat this infection. Intravenous steroids (such as dexamethasone) given at the beginning of therapy decrease the risk of death and disability caused by this infection. Meningitis accompanied by the formation of cystic accumulations of fluid that simulate tumors. Meningitis with serous exudation into the cerebral ventricles. Inflammation of the spinal cord membranes. Meningitis resulting from trauma to the meninges. Meningitis resulting from the spread of Mycobacterium tuberculosis to the central nervous system, usually from a primary focus of infection in the lungs. A form of aseptic meningitis due to infection with adenovirus, coxsackievirus, echovirus, HIV, mumps virus, lymphocytic choriomeningitis virus, polio viruses, and others. Patients report fever, headache, and stiff neck. Lumbar puncture reveals an excessive number of lymphocytes, typically without a decrease in cerebrospinal fluid glucose levels. Inflammation of the MENINGES. This can be caused by many different organisms, especially the HERPES SIMPLEX virus, the VARICELLA-ZOSTER virus that causes CHICKEN POX and SHINGLES, the meningococcus, the POLIO virus, the echo virus, the COXSACKIE virus and the MUMPS virus. Meningitis may also complicate LYME DISEASE, LEPTOSPIROSIS, TYPHUS, TUBERCULOSIS and other infections. Viral meningitis may be a minor illness but can be acute, with headache, stiff neck, fever and drowsiness progressing rapidly to deep coma. There may be weakness or paralysis of the muscles, speech disturbances, double vision, loss of part of the field of vision and epileptic fits. Most patients recover completely, but some have residual nervous system damage. There is no specific treatment for most virus infections, but herpes meningitis responds to the drug ACYCLOVIR. See also MENINGOCOCCAL MENINGITIS. inflammation of the MENINGES caused by infection, normally by bacteria such as Neisseria meningitidis or STREPTOCOCCUS pneumoniae or viruses such as MUMPS virus. n an infection or inflammation of the membranes that cover the spinal cord and brain because of a virus or a bacterium. Bacterial infection is usually more life-threatening and is indicated by the sudden onset of a stiff neck, headache, fever, and vomiting; may cause stupor, confusion, and convulsions if untreated. Antibiotics for the specific causative agent are prescribed to treat bacterial meningitis. Inflammation of membranes of brain or spinal cord. H. influenzae. Aseptic meningitis may be caused by chemical irritation, neoplasms, or viruses. Typical signs and symptoms include fever, headache, stiff neck, photophobia, or vomiting. inflammation of the meninges. When the inflammatory process affects the dura mater, the disease is termed pachymeningitis; when the arachnoid and pia mater are involved, it is called leptomeningitis or meningitis proper. It is also classified as fibrinous, hemorrhagic, purulent or eosinophilic, depending on the principal reaction of the tissues. The term meningitis does not refer to a specific disease entity but rather to the pathological condition of inflammation of the tissues of the meninges. The etiological agent can be anything that activates the inflammatory process, including both pathogenic and nonpathogenic organisms, such as bacteria, viruses and fungi; chemical toxins such as lead and arsenic; contrast media used in myelography; and metastatic malignant cells. In animals there are no specific meningitides, most cases of meningitis occurring as secondary complications to other diseases and having a bacterial etiology. Clinical signs seen commonly include fever, cutaneous hyperesthesia and rigidity of the muscles of the neck and forelimbs. A cerebrospinal fluid tap should assist in the diagnosis. an acute, aseptic nonsuppurative meningitis seen in young Bernese Mountain Dogs of unknown etiology. an inflammation of the brain and spinal cord; it may be caused by many different organisms. inflammation of the meninges of the spinal cord. Q. What Causes Meningitis? I was told that meningitis is a very infectious disese. What causes meningitis? A. Most cases of meningitis are caused by microorganisms, such as viruses, bacteria, fungi, or parasites, that spread into the blood and into the cerebrospinal fluid (CSF). Non-infectious causes include cancers, certain drugs and more. The most common cause of meningitis is viral, that is usually less severe. Bacterial meningitis is the second most frequent type and can be serious and life-threatening. Bacterial meningitis is a medical emergency. Q. does my daughter need a meningitis vaccine? A. Yes I require all girls to get vaccinated.That makes one less to have HPV or to get cervical cancer.I have a sister who got the vaccine. Salma said that highest incidence of meningitis is between zero to two years, with the greatest risk immediately following birth and at 3-8 months. Viral meningitis is a leptomeningeal inflammatory response induced by viral infection, manifesting as colorless and transparent cerebrospinal fluid with normal or increased pressure, normal sugar and chloride content and slightly increased proteins. Because it can strike quickly and be difficult to detect, we fund pioneering preventative research to wipe out meningitis, as well as provide support and care to those affected. 15] Consistent CSF findings with acute bacterial meningitis include a polymorphonuclear pleocytosis, hypoglycorrhachia and a raised CSF protein level. Meningitis treatmentmarket is classified on the basis of causative micro-organism type, Treatment type, Type of settings and geography. In 2013, WHO said just 4 laboratory-assured cases of meningitis A were reported by the 26 nations in the belt. The bacteria which causes meningitis cannot survive outside the body for longer than a few seconds, so they cannot be found in sea water. International charity Meningitis Research Foundation, estimates that meningitis and septicaemia affects nine people in the UK and Ireland every day. At Meningitis Now we're determined to fight it on all levels - through funding vital vaccine research, raising awareness so people know the signs and symptoms and supporting those struggling with the effects of the disease. Meningitis can be either viral of bacterial and there are around 3,500 cases of bacterial meningitis and septicaemia each year. The Meningitis Research Foundation are targeting teenagers and young adults and urging them to "Get The Message".